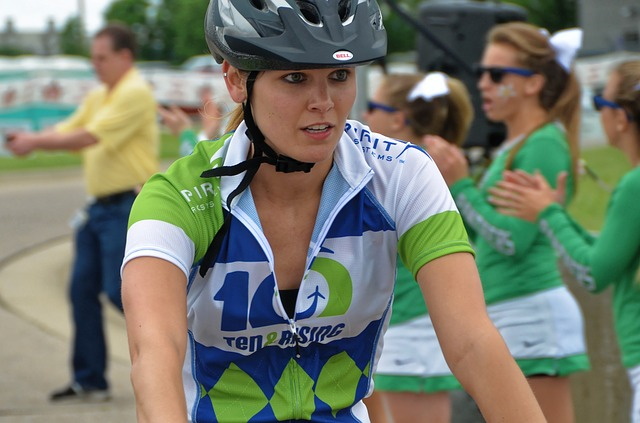 A woman cycles to raise money for a diabetes awareness event. A recent systematic review of the research literature shows that diabetics can safely take Coenzyme Q10 supplements to achieve documented heart health benefits. A 2016 systematic review and meta-analysis of the evidence from randomized controlled trials has shown that daily supplementation with Coenzyme Q10 slightly but significantly reduced fasting blood sugar levels. Another good thing: Coenzyme Q10 supplementation did not significantly affect fasting insulin levels or Hb1Ac levels. Chronic heart failure patients in the Q-Symbio study experienced a 43% relative reduction in risk of death from heart disease and an equally large reduction in the risk of hospitalization or re-hospitalization [Mortensen]. Live-at-home healthy elderly citizens, aged 70-88 years, in the KiSel-10 study experienced a 53% relative reduction in the risk of death from heart disease and statistically significant improvement in heart function and hospitalization rates [Alehagen]. Military veterans diagnosed with Gulf War Illness experienced statistically significant improvements in several physical health and quality of life symptoms [Golomb]. Okay, the Moradi systematic review did not show that supplementation with Coenzyme Q10 is associated with major improvements in bio-markers of diabetes. The study results showed a slight but significant improvement in fasting blood sugar levels and no significant effect on fasting insulin levels and Hb1Ac levels. That means that taking Coenzyme Q10 supplements will not upset our blood sugar control. Note: Hb1Ac is a measure of an individual’s average blood sugar levels over a period of months. It is a bio-marker for longer-term blood sugar status. There is some evidence – not conclusive as yet – that there could well be an association between oxidative stress and type-2 diabetes. No one knows yet what the exact mechanisms are that link oxidative damage to an increased risk of developing diabetes [Moradi]. Note: Oxidative stress is commonly understood to refer to a gross imbalance in the body between the numbers of harmful free radicals (molecules that are highly reactive) and the numbers of antioxidants, such as Coenzyme Q10, that are available to neutralize the free radicals. Free radicals, in their reacting to become stable, will strip electrons from other molecules, which will then re-stabilize themselves by stealing electrons from other molecules. The resulting chain reaction has a domino effect, damaging cell DNA and proteins and lipids in its path. Free radicals are a constant problem. Our bodies produce them as a by-product in the course of combining glucose with oxygen to produce energy (to put it in the simplest of terms). Moreover, our bodies are constantly exposed to environmental causes of free radicals. At the same time, a certain quantity of free radicals does perform useful functions in the body. Where does Coenzyme Q10 fit in? Coenzyme Q10 is an important lipid-soluble antioxidant. Coenzyme Q10 is known to interact with and neutralize harmful free radicals [Saini 2011]. Our bodies begin to produce less and less Coenzyme Q10 with increasing age once we reach our 20s (become adult, in other words) [Kalén]. Moreover, the use of statin medications to block the body’s bio-synthesis of cholesterol also results in the blocking of the body’s bio-synthesis of Coenzyme Q10, an unfortunate unintended consequence of taking a statin medication [Okuyama]. It is nearly impossible for us to make up the deficit of Coenzyme Q10 through diet alone. Dr. William Judy of the SIBR Research Institute, himself a long-time Coenzyme Q10 researcher, has said that we would have to eat, every day, two and one-half pounds of steak or one and one-half pounds of liver or four gallons of chopped spinach every day to get enough Coenzyme Q10 from our food. It is for these reasons – the decreasing bio-synthesis of Coenzyme Q10, the inadequacy of Coenzyme Q10 in the typical diet, and the inhibiting effect of some medications – that we need Coenzyme Q10 supplementation. Diminished blood and tissue levels of Coenzyme have been associated with ageing and the development of degenerative diseases such as heart disease and cancer [Mortensen]. The same formulation that was used as the active treatment in the Q-Symbio study and in the KiSel-10 study has been tested in randomized controlled studies enrolling patients diagnosed with diabetes. Dr. Henriksen et al showed that daily supplementation of type-1 diabetics with 100 milligrams of Coenzyme Q10 for three months did not affect blood sugar status or insulin requirements. Neither did the Coenzyme Q10 supplementation cause any changes in the feeling of well-being of the diabetic patients. The researchers’ conclusion from the results of the study was that type-1 diabetics can safely take Coenzyme Q10 for its heart health benefits [Henriksen]. Dr. Eriksson et al showed that daily supplementation of type-2 diabetics with 100 milligrams of Coenzyme Q10 for six months did not affect glycemic or metabolic control. The researchers concluded that Coenzyme Q10 is safe for use as an adjunctive treatment of type-2 diabetes patients with associated heart disease diagnoses [Eriksson]. Daily Coenzyme Q10 supplementation has been shown to be safe for diabetes patients and is associated with significantly improved heart health outcomes. Diabetes patients will want to discuss Coenzyme Q10 supplementation with their physicians and cardiologists. The reference list below is a good starting point for such a discussion. Eriksson, J. G., Forsén, T. J., Mortensen, S. A., & Rohde, M. (1999). The effect of coenzyme Q10 administration on metabolic control in patients with type 2 diabetes mellitus. Biofactors (Oxford, England), 9(2-4), 315-318. Golomb, B. (2014). Coenzyme Q10 and gulf war illness. Neural Computation, 26(11), 2594-651. Henriksen, J. E., Andersen, C. B., Hother-Nielsen, O., Vaag, A., Mortensen, S. A., & Beck-Nielsen, H. (1999). Impact of ubiquinone (coenzyme Q10) treatment on glycaemic control, insulin requirement and well-being in patients with Type 1 diabetes mellitus. Diabetic Medicine: A Journal of the British Diabetic Association, 16(4), 312-318. Littarru, G. P., Tiano, L., Belardinelli, R., & Watts, G. F. (2011). Coenzyme Q10, endothelial function, and cardiovascular disease. Biofactors (Oxford, England), 37(5), 366-373. Moradi, M., Haghighatdoost, F., Feizi, A., Larijani, B., & Azadbakht, L. (2016). Effect of Coenzyme Q10 Supplementation on Diabetes Biomarkers: A Systematic Review and Meta-analysis of Randomized Controlled Clinical Trials. Archives of Iranian Medicine, 19(8), 588-596. Saini, R. (2011). Coenzyme Q10: The essential nutrient. Journal of Pharmacy & Bio-allied Sciences, 3(3), 466-467.